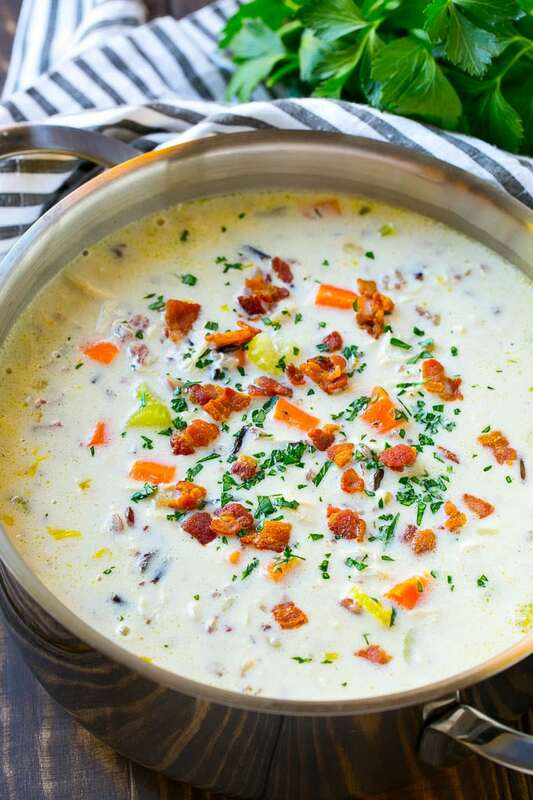 This creamy chicken and wild rice soup is loaded with shredded chicken, veggies, rice and bacon. The perfect way to warm up on a cold day! This chicken and rice soup is my take on the Panera Bread favorite, with a few twists to make it my own! Chicken soup is one of those meals that’s just irresistible. It’s easy, flavorful and comes in so many varieties. Nothing is better on a chilly winter night than chicken soup! 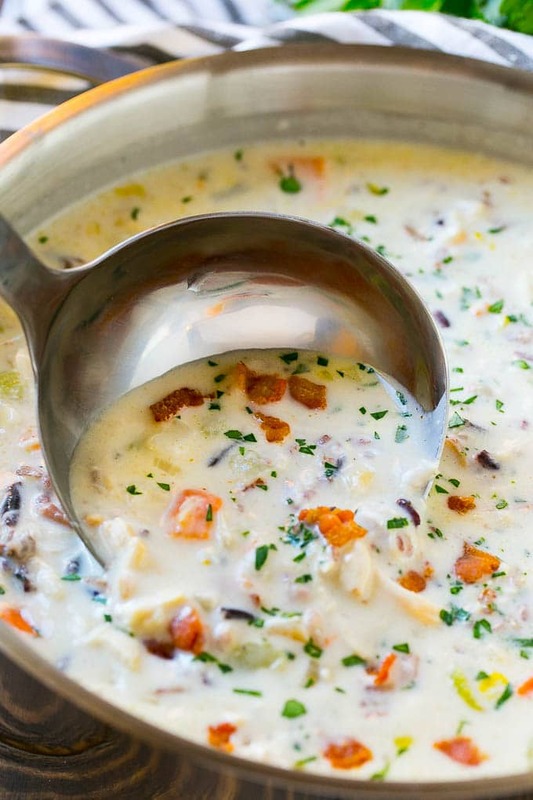 This chicken and wild rice soup is rich, hearty and the ultimate comfort food. It also happens to be easy to make! The first step to making chicken and wild rice soup is to cook up some bacon. The bacon gets reserved to sprinkle over the finished soup, and the veggies are cooked in the bacon grease for added flavor. This soup relies on cooked shredded chicken and wild rice that’s also been pre-cooked. The reasoning behind this is that creamy soups tend to not do well with an extended cook time, and some brands of wild rice need to cook for 40 minutes or more! You can use leftover chicken or rotisserie chicken to save a little time. There are also some brands of instant or pre-cooked shelf stable wild rice that can be used here to cut down on prep work. The chicken, rice and veggies all cook together in a creamy broth until all the flavors have blended. The finishing touch is a sprinkling of the reserved bacon and fresh parsley. This chicken and wild rice soup is hearty enough to serve on its own, or it’s great with a side of bread or green salad. I used to order this soup at Panera Bread all the time until I realized how easy it is to make at home! It’s the perfect twist on a classic chicken soup that’s sure to please both the adults and kids in your family. Heat a large pot over medium high heat. Add the bacon, and cook for 4-5 minutes, stirring occasionally, until crispy and browned. Remove the bacon from the pot with a slotted spoon and drain on paper towels. Reserve for later. Add the onion, carrots and celery to the bacon fat in the pot. Cook for 5-6 minutes or until just tender. Season to taste with salt and pepper. Add the flour to the vegetables, stirring to coat the vegetables evenly. Cook for 1 minute. Slowly add the chicken broth to the pot, whisking until smooth. Bring to a simmer. Add the chicken and rice to the pot and cook for 5-7 minutes or until heated through. Add the cream to the pot and simmer for another 4-5 minutes. Taste the soup and add more salt and pepper if needed. Stir in the parsley. Serve the soup immediately, topped with the reserved bacon. Any cooked chicken will work here - rotisserie, leftover chicken, whatever you have on hand! I used a wild rice blend that had the long black rice, brown rice and red rice in the mix. This looks delicious. We don’t eat dairy presently. Could we substitute with an alternative, like coconut cream or coconut milk? Almond milk or plant milk? Your suggestions and recommendations are appreciated. You could use coconut milk but it would alter the flavor of the dish. Almond milk might be a better choice although I haven’t tested it that way. Another option is to just omit the cream and serve it as a broth based soup. We are a family of 7… can we double this recipe or will it not come out the same? Can’t wait ti try this soup! It’s so cold here! Do you know if this freezes well?? This will not freeze well because of the dairy in it. Can this be made in a crock pot?! I think you could make it in the crock pot. Put the onion, carrots, celery, chicken broth, salt and pepper, 2-3 raw chicken breasts, and 1/2 cup uncooked wild rice in the crock pot. Cook on LOW for 6-8 hours or HIGH for 3-4 hours. Shred the chicken with two forks. Whisk together the flour and 1/2 cup water, add to the crock pot. Cook on HIGH for 30 mins until soup has started to thicken. Stir in cream. Add cooked bacon and parsley then serve. This is just an approximation, I have not tested this method in my kitchen! This looks really comforting and flavorful! Such a great staple meal for winter! I have been looking for some new soup recipes to try. This looks so delicious and easy to make. I am sure it will be a big hit. ITS been way colder than normal here, and I have been craving soup. This one looks perfectly hearty and delicious. 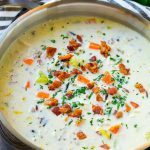 This soup sounds like something that my boys will enjoy very much especially because of the chicken and bacon! I’m sure they’re going to love this and I’m definitely keeping the recipe! I really appreciate soup recipe around this time because of the cold weather. Chicken is a lovely ingredient in soups and this one looks absolutely delicious! I would love to give it a try! Your soup has great color! Chicken soups are some of my favorites. I wanted to make some today during the blizzard but the store was out of chicken! 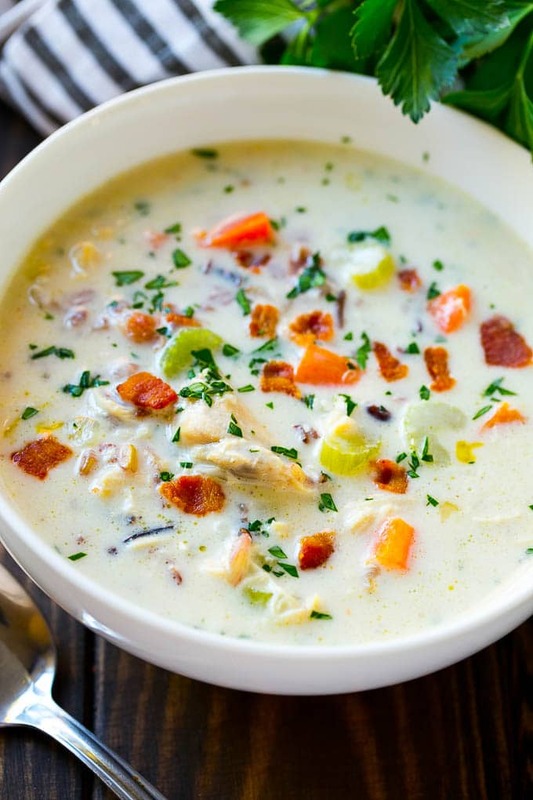 Chicken and wild rice soup sounds like a great option to make up on a cold day like today. I will try your recipe and see if the family enjoys it! This looks so hearty and filling. A complete meal in itself with ingredients from all food groups. I am making this for the family tomorrow. This is going to help keep our bodies warm and our tummies happy. That looks super tasty! I love to make soups like this for the family. With five kids, soup is the perfect recipe. I can make a huge pot of it and feed us for days. What are they REFERRING to when they say “CREAM” under instructions #7?. what if you don’t want to add cream (dairy sensitive) – how does the recipe turn out? It should still be good it just won’t be as rich and creamy!